To make sauce, in 1-quart saucepan, heat chili sauce, jelly, wine and mustard over medium heat, stirring occasionally, until jelly is melted. Heat coals or gas grill for indirect heat. Cut ribs into serving pieces. Place ribs in 4-quart Dutch oven; add water. Heat to boiling; reduce heat to low. Cover and simmer 5 minutes; drain. Success : Follow these steps when grilling over indirect heat. Before heating a charcoal grill, place a drip pan directly under the grilling area, and arrange coals around the edge of the firebox. Grill food over the drip pan. If you have a gas grill, place the food over the unheated side. Oven Directions: Want to stay inside? Bake these ribs instead. Omit the water and simmering step. 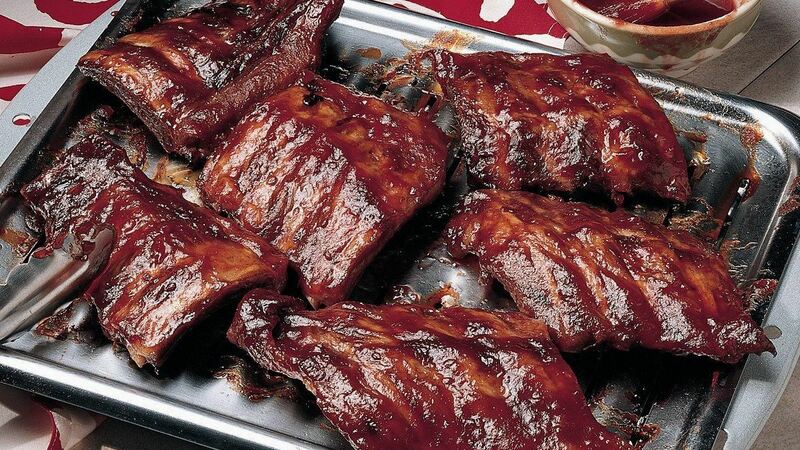 Place ribs on a rack in a shallow roasting pan. Bake uncovered at 325ºF for 1 1/2 hours; brush with sauce. Bake uncovered about 45 minutes longer, brushing frequently with sauce, until tender. Heat any remaining sauce as directed in step 4.